Our decision to admit you is based upon the assumption that you will complete the planned courses listed on your application and earn satisfactory grades. If you drop or switch a course, or if you earn less than a C grade in a course, you must notify us promptly. In many cases, we will be able to accommodate your changed schedule or help you find a way to make up a low grade. Failure to inform us of these changes can be grounds for admission denial. Freshmen: You received any D or F grades in "a-g" coursework during your senior year. Transfers: You received any D or F grades in transferable college courses. Along with the notification, we require a written explanation and your plans for making up your non-passing grade. We encourage you to repeat the course or take a comparable course to clear the deficiency. 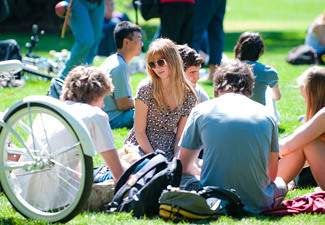 Please keep in mind that repeating or otherwise making up a non-passing grade does not guarantee admission to UC Davis. Seek advice from your high school or college counselor before you take any action to correct these grades. Dropping a course can affect your admission, so we strongly encourage you not to drop any courses listed on your application. You must maintain your freshman "a-g" subject requirements or transfer preparation to maximize your opportunity for admission and enrollment. Before dropping a course, please seek advice from your high school or college counselor. Our admission counselors may help you establish whether you will still meet UC admission requirements. Contact us through our MyAdmissions website. We will review your file, determine if you have met the requirements for admission and notify you of our decision. Freshmen will be notified before their May 1 SIR deadline; transfer students will be notified before their June 1 SIR deadline.